The modern independent suspension system on your Honda is engineered to keep the tire in alignment with the road to maintain traction and handling no matter what the angle of the steering or suspension is. To accomplish this, spherical bearings called ball joints are used to connect the steering knuckle to the control arm that locates the entire wheel assembly within the fender and connect it to the vehicle's chassis. Additionally, your Honda also uses four other ball joints to connect the steering rack to pivots on the front wheels that allow you to steer the car. 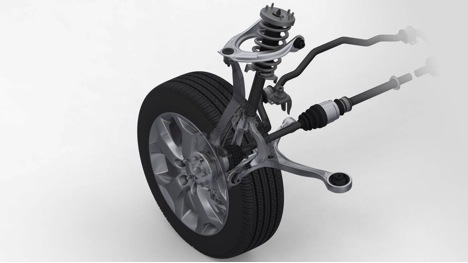 On vehicles with MacPherson strut suspension, there is only one ball joint that connects the bottom of the hub carrier with the control arm. With multilink or double A-arm suspensions, there can be two or more that connect both the top and bottom of the hub carrier to the suspension. But no matter how many ball joints there are on your Honda, they always take a tremendous amount of abuse when you're driving. Even on a perfect road, the twisting forces caused by braking, acceleration, and cornering will cause the ball joints to wear. But as we know, most Honda drivers live and drive in the real world where the roads have potholes, cracks, and speed bumps. All of which can accelerate wear on your vehicle's ball joints and tie rod ends. And if you live in a northern climate, ice and snow during the winter followed by a long summer construction season can make the wear and tear even worse. Before you even realize, it could sound like your Honda's suspension is ready to rattle itself apart. But beyond the rattle or knocking sounds you might hear from your suspension, worn ball joints can cause vehicle instability, vibration at speed, imprecise handling, and even poor gas mileage. And at the extreme, a very worn ball joint can even separate completely which can cause body damage, detached wheel assemblies, and complete loss of steering control. The best time to have your suspension examined and serviced is in the fall before the wet winter weather hits. Often, ball joints fail because of a failed rubber boot that normally protects it from the elements and keeps the lubricating grease inside. A tear or cracks in the rubber boot can cause the grease to leak and dirt to work its way inside where it can act like sandpaper on the highly polished internal surfaces. Adding water and road salt to the mix, compounds the damage and quickens the rate of wear. Also, it's easier to see any failed suspension components when they are dry and not stained with dried road salt. To properly diagnose a failed ball joint, lift the suspected corner of your Honda off the ground with a jack but leave the wheel attached. Grab the tire at the 3 and 9 o'clock positions and try to move the tire back and forth around it's steering axis. The linkage should be tight, and if you notice any looseness or play as you turn the wheel it usually indicates a bad tie-rod end. Similarly, a lower ball joint can be diagnosed by moving the tire up and down vertically. But this can be difficult to do by hand and so many mechanics will use a lever between the knuckle and control arm to manipulate the parts and see if there is any play between the two parts which is a sign of a worn lower ball joint. It both cases, it's best to replace the joints as soon as possible to avoid a potentially dangerous situation on the road. If you've noticed any of these signs of worn Honda Ball Joints or Tie Rod Ends, order online at BKHondaParts.com using the suspension parts diagrams our comprehensive catalog or contact one of our Honda Parts Representatives by phone at 877-674-5525.